In the heart of Chesapeake&apos;s Great Bridge community sits an old home circled by a small parking lot. Walk inside the unassuming home and you&apos;ll discover a treasure trove of local artistic wonders covering the walls of this two-story shop-welcome to 3 Little Black Birds. 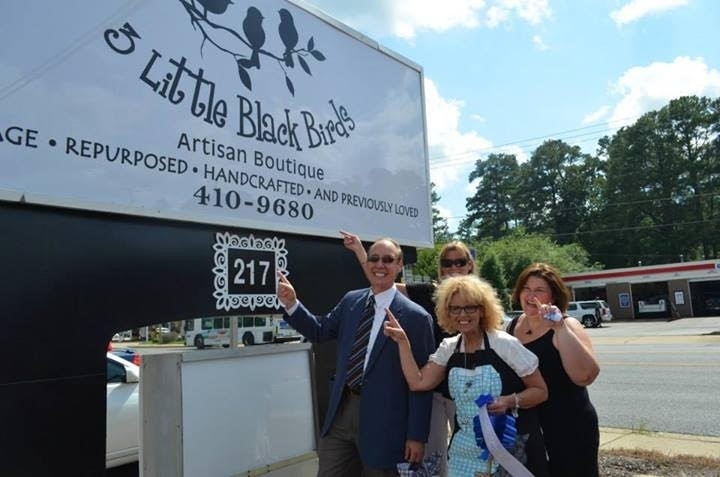 Boasting over 85 artists, 3 Little Black Birds offers vintage, re-purposed, handcrafted and antique items that are perfect for anyone on your shopping list (including yourself). The eclectic mix of one-of-a-kind artisan pieces make this store truly a shopper&apos;s delight. Inspired by the wonderful creations around you? Let your inner artist out with makers&apos; courses at 3 Little Black Birds. Bask in an aromatic candle-making class. Learn wooden sign making and take home your new boat anchor, flip-flops, whale and many others. Classes revolve around popular and seasonal topics, so check out their Facebook Events Page for details on upcoming courses. Pam Still co-founded the store back in 2013 with her two business partners. "Every single one of our artists has their own vibe," says Still. "I&apos;m always blown away by the ideas they come up with. It&apos;s enchanting. You come in here and you just get lost in the fun." Still says both women and men fall in love with the store when they visit. "If you&apos;re into Pinteresting or can&apos;t get enough of HGTV, 3 Little Black Birds is your crafting and re-purposing oasis."